After several months of slowing sales growth, Costco's underlying sales trend improved modestly in June. Over the last several decades, Costco (NASDAQ:COST) has built a reputation for generating steady sales growth. A combination of new store openings and strong comp sales growth has allowed the wholesale club giant to grow from $20 billion of revenue two decades ago to nearly $120 billion of revenue today. 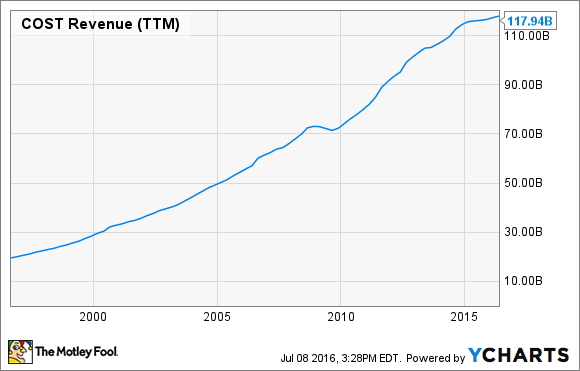 Costco revenue, 1996-present. Data by YCharts. However, in the past year or so -- and particularly since December -- Costco's sales growth has started to slow. Fortunately, the company's June sales results point to a potential return to stronger sales trends. After years of consistent 6%-7% comp sales growth (adjusting for changes in fuel prices and foreign currency fluctuations), Costco's sales trend has slowed noticeably since late 2015. From January to March of 2016, adjusted comp sales rose by 4% every month. That was still a solid result compared to peers, but it fell short of Costco's lofty standards. Sales growth slowed again in April, with adjusted comp sales up 3%. Comp sales growth inched back up to 4% in May -- but in reality this represented another step downward. Due to the timing of Memorial Day, Costco had an extra selling day in the U.S. in May 2016 compared to the prior year. Without this boost, comp sales would have increased less than 2% year over year. To some extent, Costco's sales slowdown has been caused by the strong dollar, which has led to deflation across many product categories. As a result, Costco has to sell more stuff to generate the same amount of revenue. By contrast, food cost inflation in particular had provided a long-term sales tailwind for Costco in the previous five years or so. It's hard to quantify how much of the slowdown in Costco's sales growth was caused by deflation rather than deeper issues in the business. But the downward trend in comp sales growth from late 2015 through May was worrisome nonetheless. A return to stronger growth? Costco experienced a modest uptick in sales growth during June (adjusting for the calendar shift impact on May sales). Adjusted comp sales rose 3% year over year, with the best performance coming from Canada. Costco generated particularly strong sales growth in fresh foods despite the ongoing impact of deflation on that key category. Costco's sales trend improved modestly in June. Image source: The Motley Fool. Costco's sales result last month could have been worse, considering that the company completed its long-awaited U.S. credit card transition on June 20. Some members did not get their new cards in time or had trouble activating them, factors that could have negatively impacted sales near the end of the month. As Costco and Citibank work out the kinks with the new credit card, any transition-related sales pressure should quickly recede. How much will Brexit hurt? Last month's Brexit referendum has added a new source of uncertainty for Costco. Twenty-seven of Costco's 708 warehouses are located in the United Kingdom, representing a small but non-negligible part of its business. Interestingly enough, Costco pointed to the U.K. as one of its better-performing markets during June. However, the Brexit vote occurred near the end of the month. Furthermore, Costco reports its country-level sales highlights in local currency terms. This ignores the fact that the British pound has fallen by roughly 15% relative to the dollar since the votes were tallied. The slumping British pound will definitely add to the headwinds for Costco's unadjusted comp sales results. Beyond that, Costco may be able to escape significant damage, because it primarily sells basic necessities that people need to buy even when the economy isn't doing well. Investors should certainly keep an eye on Costco's results in the U.K. during the next few quarters. But as long as Costco can get back on a stronger sales trajectory in the U.S., the company should be able to deliver solid earnings growth despite facing some volatility abroad.